Happy Ours boasts the largest and newest rental fleet in the area! We take pride in offering the best equipment. We do this by purchasing the highest quality equipment and selling our used equipment before they show any wear and tear. Equipment is checked before and after each rental to make sure it is fit for use. Every vessel meets U.S. Coast Guard requirements for safety, and comes equipped with seats, paddles, life-vests (PFDs), and a whistle. You can launch from our bayside beach right here at Happy Ours, or you can explore other nearby sites like St. Joseph Peninsula State Park or St. Vincent Island. We do offer local delivery for a small fee, or we rent roof-top pads if you prefer to carry them yourselves. 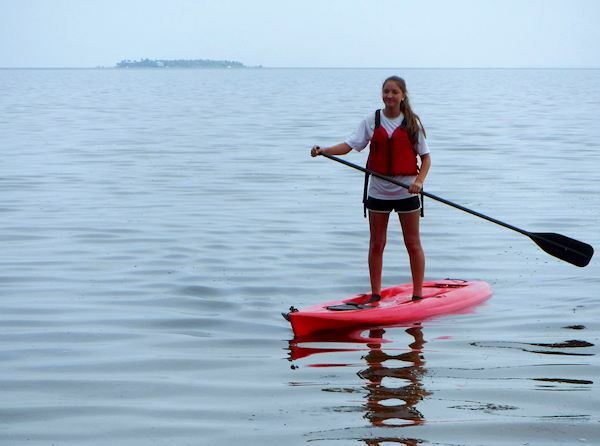 If you have never paddled a kayak or canoe before, we are happy to provide in-shore demonstration and instruction when you launch from our site. We also give new-comers navigation tips on St. Joseph Bay so they don't get lost. We have models to fit most needs. 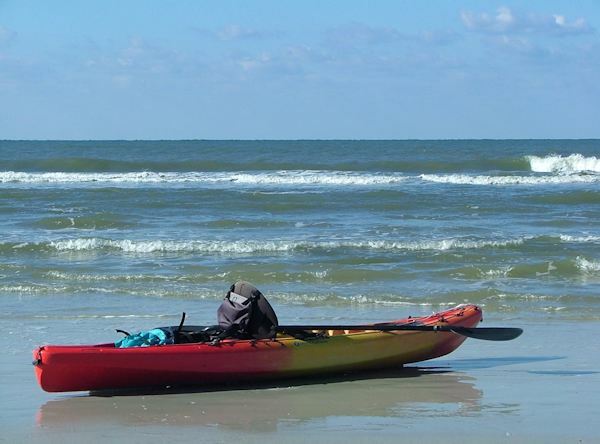 Our touring kayaks are designed for speed; some are more suited for easy maneuvering and stability. We have small kayaks for young paddlers, and large kayaks to fit XL paddlers. Our kayaks may be equipped for fishing or snorkeling. Some of our tandem kayaks will accommodate a third passenger if they are less than 50 pounds. All kayaks come with seat backs, and we have optional tall-back seats for those who may need additional support. The paddles come in various length and weight, and all paddles are equipped with a leash so you won't loose them. Yes, we do have a canoe for those traveling with pets. Dogs must be on a leash and under control while on our premises. 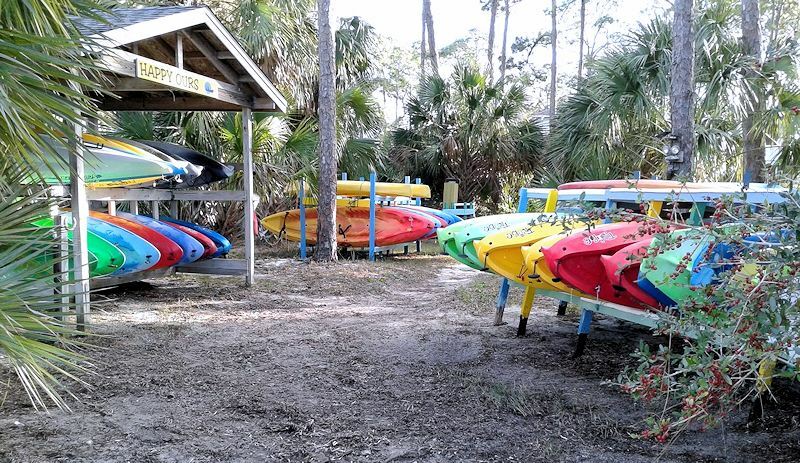 If you have never paddled a kayak or canoe before, we are happy to provide in-shore demonstration and instruction when you launch from our site. Click HERE for stand up paddleboard instructions by Denny. We also offer newcomers navigation tips on St. Joseph Bay so they don't get lost. On a flat calm day, nothing beats the view from a standup paddleboard. Our large selection of boards come in a variety of shapes, sizes and materials to fit your needs. We have stable models for beginners and others built for speed in open water. Some of our paddleboards are light-weight foam construction and easy to carry to the beach and others are built to carry heavier loads. Rental includes life-vest (PFD) and paddle; some models are also equipped with an ankle leash. Only one passenger permitted per board. For snorkeling equipment, see the "Optional Equipment for Rent" section of our Rates page. 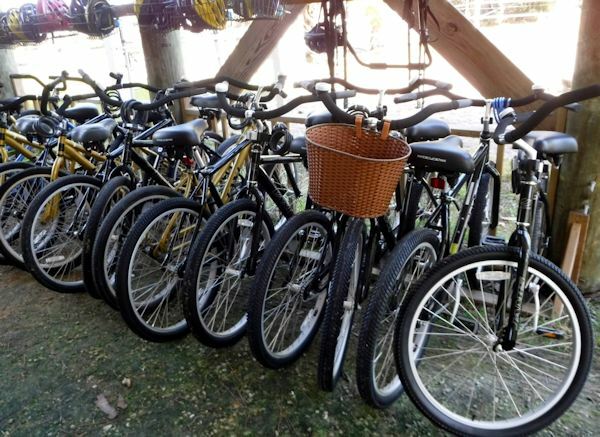 Our bicycle fleet was added in 2012 and we're still growing. We have one-speed coaster bikes size 20" for youth up to 26" for adults. Because you asked, we added trailers for toddlers, and a 16" bike with training wheels. All of our bikes come with helmets, baskets, locks, and whistles. The new Loggerhead Trail is a multi-use bike path that runs right by our front door and takes you all the way from Salinas Park to St. Joseph Peninsula State Park. We are located near mile marker 1. NOTE: Bicycles may not be ridden on the beach or other off-road rugged terrain.